Bashundhara Kings completely obliterated Maldivian champions New Radiant Sports Club by 4-1 goals in their club friendly match at Sheikh Kamal Stadium in Nilphamari on Friday. Kings took the early lead in the 19th minute of the match courtesy of a brilliant touch by their Haitian forward Kervens fils Belfort. Belfort toed the ball into the nets off a sensational center of Kings prized recruit Daniel Colindres. Next it was the turn of Kings skipper Tawhidul Islam Sabuj to lead by example as he scored the second goal from a fantastic header on the 21st minute of the match from a right wing cross from Belfort. Bashundhara went into the second half with a lead of 2-0. 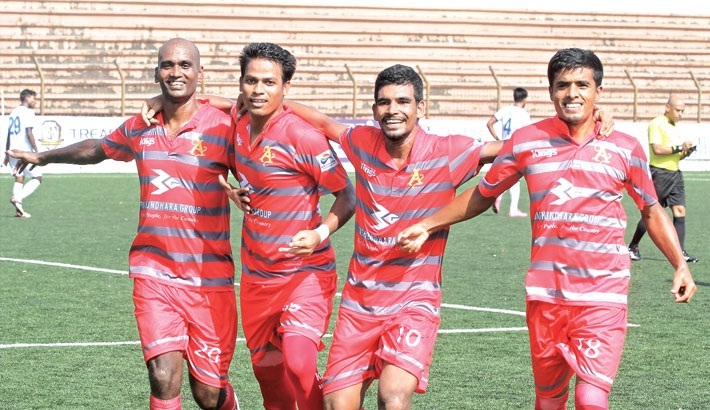 Goal-fest went on for Bashundhara Kings in the second half as well. Kings foreign attack-spearhead Zallu scored a stunner on the 51st minute and took Bashundhara to a 3-0 lead. Ten minutes later, youngster Mahbubur Rahman Sufil gave Bashundhara Kings the fourth goal. Moments later, New Radiant’s Ugandan forward Capson scored the lone goal for his team.